Low Retention Tips. Low Binding Tips from Capp Denmark. 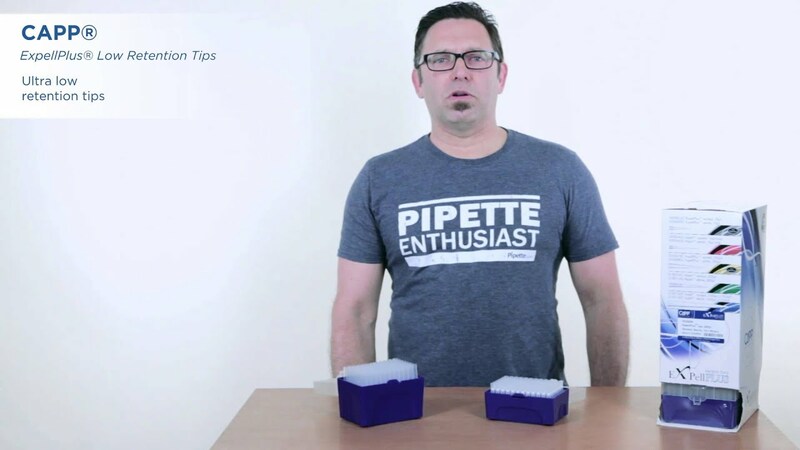 Capp ExpellPlus low retention pipette tips have ultra-smooth inner surface, reducing sample binding to the absolute minimum. Thanks to the composition of the PP material used by the production of ExpellPlus low retention tips and the high quality Swiss molds, on which the tips are being manufactured, the low binding properties of Capp tips are achieved without the use of any surface additives. ExpellPlus low binding tips are the perfect choice for volumes below 1mL and for all applications requiring ultimate precision. Capp ExpellPlus low retention tips are manufactured in a clean-room facility and are all RNase, DNase and Pyrogen free certified and sterile. Below picture shows a comparison of the liquid remaining after dispensing in standard tips (to the left) and Capp low retention pipette tips (to the right). ExpellPlus low binding tips are universally compatible with the majority of other pipette brands. Contact us to receive free samples of Capp low retention pipette tips. ExpellPlus 10ul, pre-sterile, clear, bag, 20x1000 pcs. ExpellPlus 10µl XL, pre-sterile, clear, bag, 20x1000 pcs. ExpellPlus 10µl XL, Extra Narrow, clear, bag, 20x1000 pcs. ExpellPlus 200µl, pre-sterile, clear, bag, 10x1000 pcs.